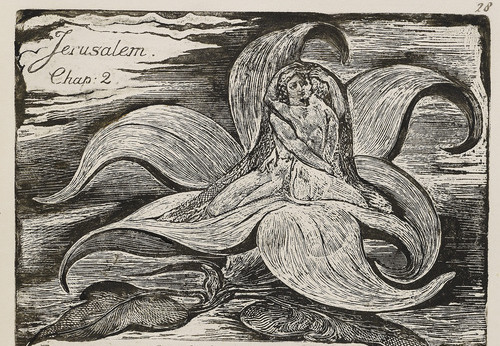 The William Blake Archive is pleased to announce the publication of a digital edition of Jerusalem The Emanation of The Giant Albion Copy F, from the Morgan Library and Museum. Jerusalem is Blake’s masterpiece in illuminated printing, consisting of 100 relief and white-line etchings divided into four chapters. It is his longest illuminated book and its plates are among his largest, at approximately 22.5 x 16 cm. Though dated 1804 on its title plate, it was not printed in its entirety until c. 1820. 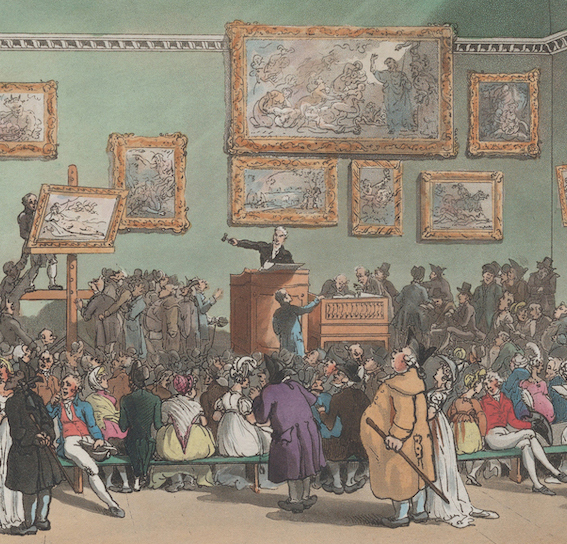 Sixty plates may have been completed by 1807; a few examples were exhibited in 1812. The printing of 1820 produced Copies A, C, and D. In the next year, Blake printed Copies B (chapter 1 only, Plates 1-25) and E. Blake printed Copy F in 1827. Copies H-J are posthumous. Most lifetime copies have hand tinting in gray or black, but only Copies B and E are colored. There are two arrangements of the plates in chapter 2, early (Copies A and C) and late (Copies D and E). Copy F has a fascinating history. It was the last copy of Jerusalem printed—as well as the last illuminated book— but its chapter 2 followed the early plate order of Copies A and C when delivered to its first owner—rather than, as one would expect, the later arrangement of copies D and E. Blake, or more likely his wife Catherine, sold Copy F to William Young Ottley for £5.5s on 11 August 1827—the day before Blake died. Blake apparently left the book uncollated on his deathbed. His friend and patron, the artist John Linnell, arranged and numbered the plates and added at least the hand coloring in Chinese white and perhaps some or all of the gray and black washes before delivering Copy F to Ottley on 16 Aug. 1827. However, Blake had begun to number the plates in pen and ink, 1-100, though remnants of these numbers appear on only 29 plates. Blake intended to order chapter 2 as he had in Copies D and E, which is the order of Copy F in the Archive. Linnell either wrote over Blake’s numbers or rubbed them out and added the sequence of pen and ink numbers, top right. Linnell presumably used his own copy of Jerusalem, Copy C, as the model for his numbering. The identity of the plates that Linnell altered, along with a thorough bibliographic description of Copy F and its provenance, is recorded in Copy Information, accessible under any image of Copy F in the Archive. Jerusalem Copy F joins the magnificently colored Copy E in the Archive and will eventually be joined by Copy A, whose plates in chapter 2 are arranged differently, and by Copy I, a posthumous copy, presumably printed by Frederick Tatham, who obtained the copperplates of Blake’s illuminated books after Catherine died in 1831. The Archive now contains fully searchable and scalable digital editions of 105 copies of Blake’s nineteen illuminated books. Jerusalem Copy F is among the first publications in the redesigned Archive, which is faster and easier to navigate, is aesthetically more appealing, and offers a more robust search feature. Users may view color corrected digital images of Blake’s works at their true size, and enlarge and rotate these images to examine the text and illustrations in detail. The images are accompanied by diplomatic transcriptions and editors’ notes, as well as illustration descriptions that make it possible to search Blake’s works for visual motifs. And, as noted, the Archive also provides full bibliographic and provenance information for each digital edition it publishes.